House Sitting is one of the best ways to stay on budget while traveling. While looking after someone’s pets or house, you get to visit the area where the homeowner lives. It’s an ideal solution for travelers and house sitters as well as homeowners who still like to get away every once in a while. Especially house sitting in Europe is a great idea to save loads of money on accommodation and there are many pet sitting jobs in Europe on a variety of house sitting websites. We’ll explain how to become a house sitter and how to find the best house sitting jobs online. Most house sitting platforms are worldwide, while some are designated to a certain area or continent. For Europe, these are the very best house sitting platforms. This house sitting website originates in the US, but they also have a Trusted Housesitters Europe website. To find house sitting jobs in Europe, Trusted Housesitters is the very best option. Joining Trusted Housesitters for 1 year comes with a cost of 89€. It’s a great price because when traveling in Europe, 2 nights of cheap accommodation cost more than that. Trusted Housesitters list over a thousand assignments on an average day. With this number, it is the largest house sitting platform currently online. The platform works with verification levels to ensure security and trust when you can choose to get an enhanced level of security to police checks and criminal records. This is optional and the standard security level can be achieved by identity and email verification. Trusted House Sitters is the best House Sitting platform since they have a great support team. They even have a Vet Advice Line you can contact at any time with pet emergencies and questions. They also have loads of awesome online documentation to help you with all your questions. On the second place, Nomador is another great option to find cool pet sits in Europe. This house sitting website has most of its house sitting jobs in France, but also in other countries in Europe. But if you plan on visiting France, you must check out Nomador. Nomador has listings all over the world, most of which are located in France, Europe, and the US. Some countries are not represented at all right now, but that could change overnight. Nomador has an extensive FAQ section which will answer most of your questions immediately. They don’t provide assistance with possible pet issues. You should exchange veterinary information with the pet owner. We haven’t had the need to get in touch with Nomador yet, but they have a contact button in their website footer. You can try Nomador for free for your first 3 applications. After that, a 1-year membership costs 65€. A third option for finding house sitting jobs in Europe is Mind My House. They recently revamped their website and it’s looking great. Mind My House is the cheapest of the three. You can become a member for 20€ for a full year. But they also have fewer house sitting jobs available. You can either choose to become a member of different pet sitting platforms like we once did. But I can recommend just becoming a member of the best one and be set for good! Trusted Housesitters is the best house sitting platform for Europe, but also for the rest of the world. And they’re very worthy of the higher price tag because they offer a great service and assistance. Check out Trusted Housesitters right now! Now that you know which is the best platform, you can start browsing the house sits and find your dream destination in Europe. But you haven’t landed the job yet! 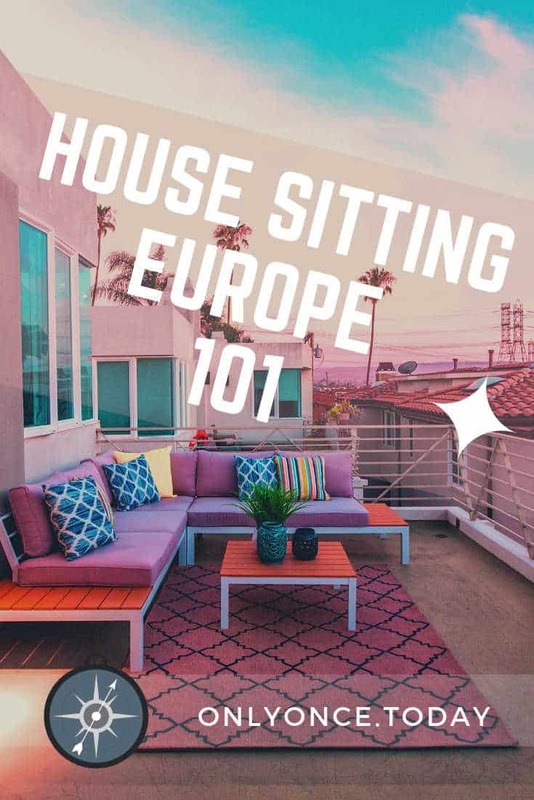 Some destinations are super popular and often hundreds of applicants want to do the very same sit, just because it’s a beautiful apartment in the heart of Vienna, Budapest, or Paris. So you still need to up your game in order to land your first pet sitting job! Once you’ve selected one or more platforms to become a member and try out, you’ll be looking for destinations and house sitting assignments. You’ll quickly notice that they aren’t all alike. Some homeowners offer little to no information, accompanied by one blurry picture of the tail of their pet. Other homeowners are avid writers and they filled in every question with a chapter of a book. I love it when the assignment has a lot of pictures and just the right amount of information: clear and to the point. Although it’s better to get too much information than too little. Once you agree on collaboration, you’ll be needing a lot of information anyway. You just need to know a lot of things, like the location of the pet food, in order to complete a house sit like a pro. Make your pet sitter profile stand out! Once you signed up, you can start making your pet sitter profile. Don’t go too quickly over this. Pet owners really check your info before they will trust you with their pets and their house. So you want your profile to look good and trustworthy. Once you think your pet sitter profile rocks, you can eventually start applying for pet sitting jobs. We noticed that this isn’t the easiest thing to do. You don’t have any reviews yet and other pet sitters have loads of reviews from other pet owners. So in the beginning, it might be difficult to land your first house sitting job. It’s a good idea to start out with applying to less popular destinations, instead of the high profile sits everybody seems to want. If you’re a fresh new house sitter, select jobs with fewer applicants. This way, you have a better chance to land the job. Getting 5-star reviews in house sits will help you to get future house sits. Home owners will rather hire a house sitter with great reviews than they will hire someone with bad reviews. So getting great reviews is pretty important! You need to do you job well and you want the home owner to smile when he or she gets back home. A long term house sitting opportunity can still vary in length. Some assignments are for one month or two months. But you can also find house sitting jobs for half a year or longer. Long term house sitting is a great way to find out if a country, region, or city is right for you. Many people chose to do a long term pet sit somewhere before they rent or buy a place. We also love the idea of long term house sitting in order to really dig into a destination and get to know the place really well! Trusted Housesitters also has a tag for long term sits and you can find these assignments here. Make sure that you’re ready to travel to Europe in advance. If you’re a citizen of an EU country, that should be perfectly OK. If you’re not a European citizen, first check if you need to get a Schengen Visa and think about the possible time restrictions. As a non-EU citizen, you’re allowed to travel in Europe for 3 months within a 6 month period, so beware of ultra long term house sitting jobs. House sitting is a great way to discover the world on a budget. But besides seeing it as an opportunity to save money while traveling the world, you should definitely see the assignments through the eyes of the pet owner and live up to the expectations. We encourage you to go beyond the expectations and make the homeowner happy to come back home. Our favorite platform is Trusted Housesitters because they are just the very best platform. It works well and they take care of their clients very well. Let us know if you tried pet sitting and how your first assignment went!